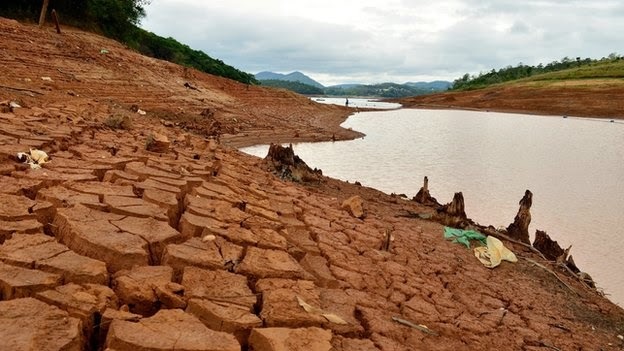 OUTR Blog: Sao Paulo running out of water!!! Is now below DEAD level!!! Sao Paulo running out of water!!! Is now below DEAD level!!! Recently (over the summer), we have been keeping an eye on the drought that is occurring in the South American city of Sao Paulo, Brazil. "Brazil drought: Sao Paulo sleepwalking into water crisis, Nov 2014"
http://www.bbc.com/news/world-latin-america-29947965 Above image is from the BBC. To put it simply and with no exaggeration, this city of some 22 million Est people will run out of water if rain is not forthcoming in the next two to seven months. Perhaps even as much of a concern, is that roughly about 80% of the electricity is sourced from Hydro Electric Reservoirs, and no doubt is adding to the economic pressure the country is currently under which has been due to their "Economic Heart"(Sao Paulo State), now being crippled by these combined factors.